'Footblister & Jaggy'. Sounds like a terrible double act, doesn't it? And it was. Way back in 1979, at the end of season Presentation Awards night for 'The Scotsman Scottish Rally Championship' in Edinburgh, a young Peter Foubister sat down at my table and asked my advice. He had been offered a full-time position at the weekly 'Autosport' magazine. I recall him telling me, 'the money's not very good and it'll mean moving to London, so it'll be a struggle'. I couldn't and didn't offer him any advice. All I said was: "They won't ask you again." Nope, this was a decision only he could take and I wished him well. He took it and motor sport is all the better for it. Yes, life was difficult during the early 1980s as he established himself, but through sheer hard graft, barrowloads of enthusiasm and a talent for adding colour to black and white reports he progressed through the Haymarket Publishing ranks. We first met in the mid 1970s. He was a member of Dunfermline CC and was doing quite a bit of navigating and co-driving and writing for their club mag 'Pace Notes'. That led on to contributing to 'Autosport' at the same time I was contributing to 'Motoring News' which was part of the rival 'Teesdale Publishing' group then. He was 'Footblister' and I was 'Jaggy', and although there was rivalry between us to get the better story there was friendship too, and I like to think respect, although Footblister was a wee bit more serious and a bit quieter than Jaggy! Motor sport was fun and life was less complicated back then. Reports were written up on a typewriter and then taken to the airport for hand delivery to London by aircraft cabin crew, or handed in to Red Star parcel offices at certain Scottish rail stations for onward delivery to London, and subsequent collection by courier firms, to Fleet Street. 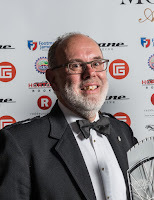 Peter started full time with Autosport in 1980 as Rallies Editor rising to the role of magazine Editor in 1988 and was instrumental in introducing computers to the weekly editorial team and production staff. He appreciated and embraced the growing importance of such technology to the production of a news publication. It was during that time that he founded the annual 'Autosports Awards' and in 1989 the first such event was staged. It grew quickly to become the premier UK motor sports award ceremony internationally recognised right across the world. He moved on from the magazine in 1996 to become Publishing Director and was involved in the creation and establishment of other magazines within the Haymarket stable, and in 2004 he was appointed CEO of Haymarket Worldwide Inc. A stint in America followed working on other titles, but he left Haymarket and returned to the UK in 2009. The following year he was appointed to the position of Motoring Secretary at the Royal Automobile Club in London. It was a less stressful position than his previous roles and he was thoroughly enjoying himself. So it came as a great shock to all those who knew him that he passed away so unexpectedly, and thankfully peacefully, at home on Friday. He was kind and honest, a man of great integrity and quiet resolve. He was also possessed of a stout sense of humour - apparently, it has been alleged that he spoke highly of me behind my back, but never admitted it to my face! Throughout his working career he kept a close eye on Scottish motor sport. Often I would receive an unexpected phone call after he had read something I had written and with which he agreed or disagreed, or if not a call, than an email from some exotic location. Over recent years I saw him less frequently, but there was always the catch-up at the Autosport Show in January. Personally, I will miss the insults, as we all will miss a good friend and supporter of Scottish motor sport and a genuinely nice man. On a wider note, British and international motor sport has also lost a great friend and supporter, and I've lost a good pal. As ever, our thoughts at times like this must be with his wife Marion, and children Gemma and Rory, his wider family, and huge circle of colleagues and friends.